In 1999, the Reverend Jerry Falwell outed Tinky-Winky, the purple character from TV's Teletubbies. Events such as this reinforced in many quarters the common idea that evangelicals are reactionary, out of touch, and just plain paranoid. But reducing evangelicals to such caricatures does not help us understand their true spiritual and political agendas and the means they use to advance them. 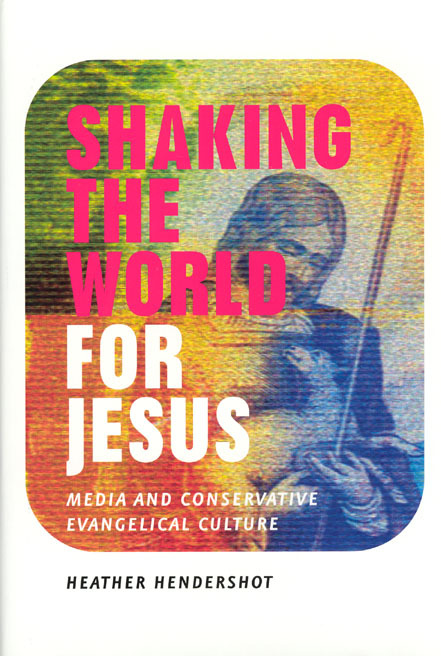 Shaking the World for Jesus moves beyond sensationalism to consider how the evangelical movement has effectively targeted Americans—as both converts and consumers—since the 1970s. Thousands of products promoting the Christian faith are sold to millions of consumers each year through the Web, mail order catalogs, and even national chains such as Kmart and Wal-Mart. Heather Hendershot explores in this book the vast industry of film, video, magazines, and kitsch that evangelicals use to spread their message. Focusing on the center of conservative evangelical culture—the white, middle-class Americans who can afford to buy "Christian lifestyle" products—she examines the industrial history of evangelist media, the curious subtleties of the products themselves, and their success in the religious and secular marketplace. Working to understand evangelicalism rather than pass judgment on it, Shaking the World for Jesus offers a penetrating glimpse into a thriving religious phenomenon. Heather Hendershot is associate professor in the media studies department at Queens College, City University of New York. She is the author of Saturday Morning Censors: Television Censorship before the V-Chip and editor of Nickelodeon Nation: The History, Politics, and Economics of America's Only TV Channel for Kids.